The first half-century of X-ray crystallography, beginning with the elucidation of the sodium chloride structure in 1914, was devoted principally to the determination of increasingly complex atomic topologies at ambient conditions. The pioneering work of the Braggs, Pauling, Wyckoff, Zachariasen and many other investigators revealed the structural details and underlying crystal chemical principles for most rock-forming minerals (see, for example, Crystallography in North America, edited by D. McLachlan and J. P. Glusker, NY, American Crystallographic Association, 1983). These studies laid the crystallographic foundation for modem mineralogy. The past three decades have seen a dramatic expansion of this traditional crystallographic role to the study of the relatively subtle variations of crystal structure as a function of temperature, pressure, or composition. Special sessions on "High temperature crystal chemistry" were first held at the Spring Meeting of the American Geophysical Union (April 19, 1972) and the Ninth International Congress of Crystallography (August 30, 1972). The Mineralogical Society of America subsequently published a special 11-paper section of American Mineralogist entitled "High Temperature Crystal Chemistry," which appeared as Volume 58, Numbers 5 and 6, Part I in July-August, 1973. The first complete three-dimensional structure refinements of minerals at high pressure were completed in the same year on calcite (Merrill and Bassett, Acta Crystallographica B31, 343-349, 1975) and on gillespite (Hazen and Burnham, American Mineralogist 59, 1166-1176, 1974). 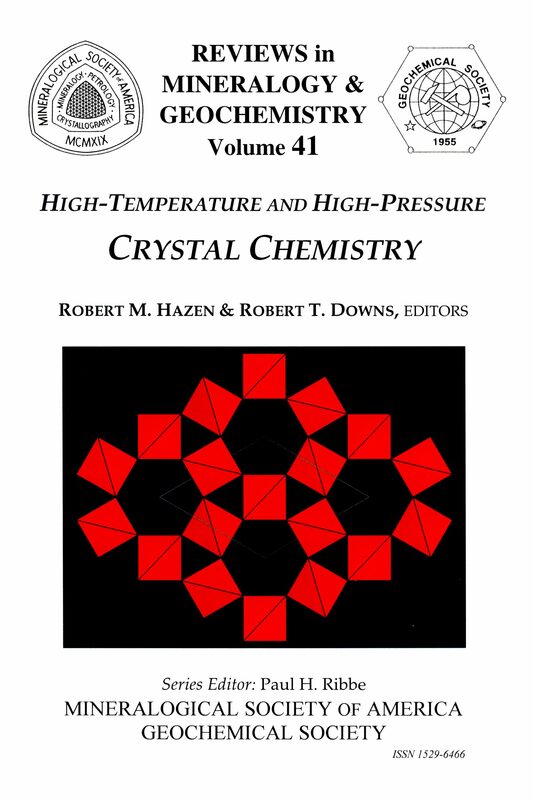 Rapid advances in the field of non-ambient crystallography prompted Hazen and Finger to prepare the monograph Comparative Crystal Chemistry: Temperature, Pressure, Composition and the Variation of Crystal Structure (New York: Wiley, 1982). At the time, only about 50 publications documenting the three-dimensional variation of crystal structures at high temperature or pressure had been published, though general crystal chemical trends were beginning to emerge. That work, though increasingly out of date, remained in print until recently as the only comprehensive overview of experimental techniques, data analysis, and results for this crystallographic sub-discipline. This Reviews in Mineralogy and Geochemistry volume was conceived as an updated version of Comparative Crystal Chemistry. A preliminary chapter outline was drafted at the Fall 1998 American Geophysical Union meeting in San Francisco by Ross Angel, Robert Downs, Larry Finger, Robert Hazen, Charles Prewitt and Nancy Ross. In a sense, this volume was seen as a "changing of the guard" in the study of crystal structures at high temperature and pressure. Larry Finger retired from the Geophysical Laboratory in July, 1999, at which time Robert Hazen had shifted his research focus to mineral-mediated organic synthesis. Many other scientists, including most of the authors in this volume, are now advancing the field by expanding the available range of temperature and pressure, increasing the precision and accuracy of structural refinements at non-ambient conditions, and studying ever more complex structures. The principal objective of this volume is to serve as a comprehensive introduction to the field of high-temperature and high-pressure crystal chemistry, both as a guide to the dramatically improved techniques and as a summary of the voluminous crystal chemical literature on minerals at high temperature and pressure. The book is largely tutorial in style and presentation, though a basic knowledge of X-ray crystallographic techniques and crystal chemical principles is assumed. The book is divided into three parts. Part I introduces crystal chemical considerations of special relevance to non-ambient crystallographic studies. Chapter 1 treats systematic trends in the variation of structural parameters, including bond distances, cation coordination, and order-disorder with temperature and pressure, while Chapter 2 considers P-V-T equation-of-state formulations relevant to x-ray structure data. Chapter 3 reviews the variation of thermal displacement parameters with temperature and pressure. Chapter 4 describes a method for producing revealing movies of structural variations with pressure, temperature or composition, and features a series of "flip-book" animations. These animations and other structural movies are also available as a supplement to this volume on the Mineralogical Society of America web site at RiMG041 Programs. Part II reviews the temperature- and pressure-variation of structures in major mineral groups. Chapter 5 presents crystal chemical systematics of high-pressure silicate structures with six-coordinated silicon. 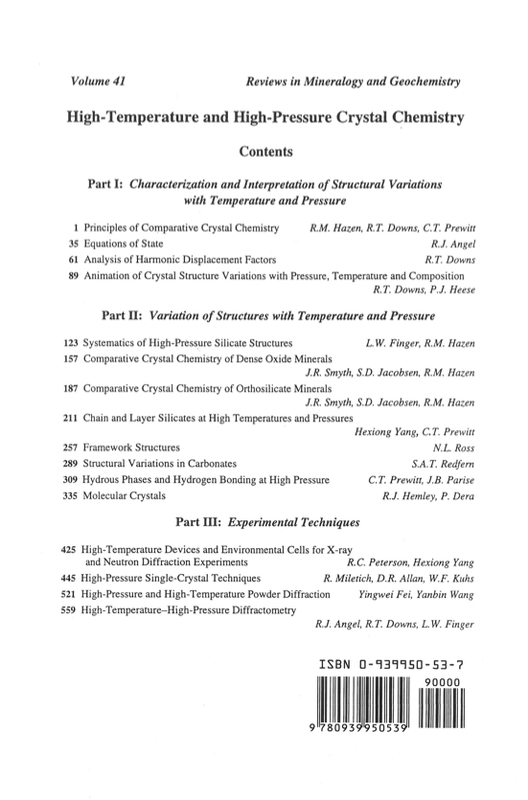 Subsequent chapters highlight temperature- and pressure variations of dense oxides (Chapter 6), orthosilicates (Chapter 7), pyroxenes and other chain silicates (Chapter 8), framework and other rigid-mode structures (Chapter 9), and carbonates (Chapter 10). Finally, the variation of hydrous phases and hydrogen bonding are reviewed in Chapter 11, while molecular solids are summarized in Chapter 12. Part III presents experimental techniques for high-temperature and high-pressure studies of single crystals (Chapters 13 and 14, respectively) and polycrystalline samples (Chapter 15). Special considerations relating to diffractometry on samples at non-ambient conditions are treated in Chapter 16. Tables in these chapters list sources for relevant hardware, including commercially available furnaces and diamond-anvil cells. Crystallographic software packages, including diffractometer operating systems, have been placed on the Mineralogical Society web site for this volume. This volume is not exhaustive and opportunities exist for additional publications that review and summarize research on other mineral groups. A significant literature on the high-temperature and high-pressure structural variation of sulfides, for example, is not covered here. Also missing from this compilation are references to a variety of studies of halides, layered oxide superconductors, metal alloys, and a number of unusual silicate structures.